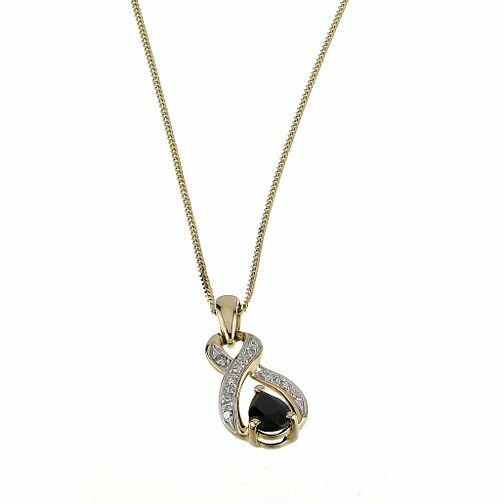 This stunning pendant features a sapphire clasped in 9ct yellow gold arms studded with diamonds. A stylish accessory for a stylish woman. 9ct Yellow Gold Sapphire Diamond Pendant is rated 4.8 out of 5 by 5. Rated 5 out of 5 by Anonymous from Wear it every day! Purchased the necklace with earrings to match as part of a Christmas gift from my parents. I wear the necklace virtually every day and it always seems to go with what I wear and with any occasion. The earrings are not overly big but complement the necklace so it makes me feel special wearing the set together. Very pleased with it.